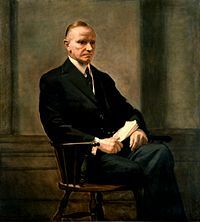 Ba é John Calvin Coolidge, Jr. (4 Iúil, 1872 - 5 Eanáir, 1933) an 30ú uachtarán Stáit Aontaithe Mheiriceá. Bhí sé i bhfeidhmeannas ó 2 Lúnasa, 1923 go dti an 3 Márta, 1929. Nuair a d'éag Warren Harding, Uachtarán SAM, go tobann in San Francisco i mí Lúnasa 1923, bhí an leas-Uachtarán , Calvin Coolidge, ar chuairt chuig a thuaismitheoirí ina bhaile dúchais, Plymouth, Vermont, 3,000 míle thoir. Fuair athier Choolidge an scéal ar an ghuthán i lár na hoiche. Mhúscail sé a mhach Calvin ar an toirt agus chuir a bhean chéile fá choinne Bíobla agus cóip de Bhunreacht SAM. Mar nótaire poiblí bhí athair Calvin in ann é a oirniú mar an 30ú Uachtarán an oiche sin agus d'fhreastal máthair Chalvin mar fhinné. Más dlíodóir rathúil agus poiliteoir grinn a bhí ann go fírinneach- fear a d'éirigh ó mhaor go seanadóir agus go hoifig ghobharnóir Massachusetts- bhreathnaigh pobal SAM ar a nUachtarán nua. Nuair a tháinig an-rath ar gheilleagar SAM le linn dó abheith in oifig, tugadh an buíochas dósan. Bronnadh 'rathúnas Coolidge' ar a thréimhse. Ba é Calvin Coolidge a d'fhógair " Is é gnó SAM an gnó'! Bhuail taom croí é in aois a 60 bliain d'aois. Tugadh an leathanach seo cothrom le dáta an 27 Márta 2015 ag 06:53.